Thank you for considering the Junior League of Boca Raton (JLBR) for your charitable contribution. Our community needs your support more than ever. Our agencies are seeing an unprecedented number of requests for help. We ask for you to partner with us to help make a difference in our community. Below are the several ways to support the JLBR to make our community better and brighter. Help migrant farm workers receive low-cost quality housing and community services. These services include a Child Development Center, which provides after-school care and tutoring. Consistently increase support to underprivileged and at-risk children in the form of ongoing, after-school and summer educational, cultural and life-enhancing programs. Build a community garden that provides a healthy supplemental food source to its gardeners and the local food banks while cultivating the spirit of community. Donations to the JLBR are tax deductible and are used to further the mission of the organization as well as the three focus areas we serve within the community: child welfare, hunger, and nonprofit support. Ways to support the JLBR can be found in our Community Partnership Program (link here). Additional donation opportunities exist for Event Presenting Sponsorships and restricted gifts for programs. Matching gifts from your employer are also a wonderful way to make your gift to the JLBR go even further. For more information about supporting the JLBR, please contact philanthropy@jlbr.org. Consider Joining or Renewing membership in the 1971 Society with a gift of $500 in celebration of the JLBR’s Annual Woman Volunteer of the Year Luncheon and Fashion Show. The 1971 Society, named for the year the JLBR was founded, is a dedicated campaign that supports our mission of developing the potential of women and that of the WVOY event, celebrating women volunteerism in our community. If your business and/or organization prefers to donate products, goods, or services for our Acquisitions program, we would appreciate those items as well. In-kind donations from businesses in our community allow us to raise additional funds at events by using your donations in support of raffles and silent auction programs. For more information on how to contribute, please contact philanthropy@jlbr.org. Consider joining us at a Future Member Social to learn more about joining the JLBR. We would love your donation of time and talents to further the mission of the JLBR and the community we serve. For more information on how to get involved, please contact info@jlbr.org. 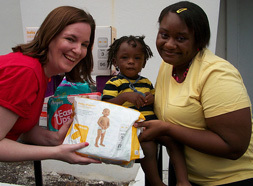 Consider hosting a Diaper Drive or Food Drive at your company or in lieu of gifts at a special celebration. There are several wonderful ways to solicit diapers for our Diaper Bank and food for our Annual Food Drive through your contacts and individual support systems. If you are interested in learning more, please contact info@jlbr.org. JLBR Members may receive credit for their Financial Commitment by making a donation to the JLBR. Donate to the JLBR Endowment Fund to support the operation and maintenance of the Vegso Community Resource Center. At checkout on Amazon, you will see the option to participate in AmazonSmile by clicking the button “Select a Charity.” Please type or select “Junior League of Boca Raton” and Amazon Smile will donate .05% of the purchase price.